It’s an undisputed fact that food tastes better when you eat it outside. 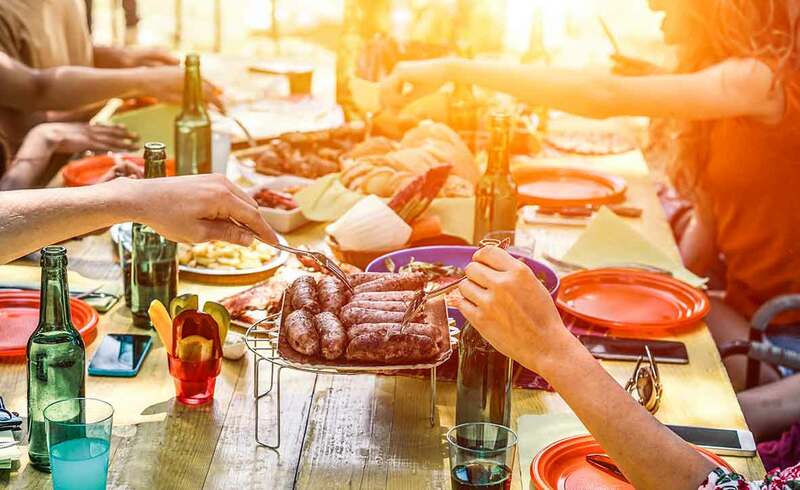 It’s even tastier when you know it comes from a BBQ and you’re revelling in the sunkissed nostalgia delivered by summer hits blasting out of a stereo speaker. Hosting the BBQ bash of the summer requires many things; a well-kept garden being the most fundamental. So is your garden ready to entertain? This step-by-step guide will tell you everything you need to know about preparing your garden for a summer BBQ to remember. You’ll also find some of our all-time favourite BBQ tunes introducing each step! First things first: to host the perfect BBQ party you need a great-looking garden that feels welcoming to your guests. If your garden’s at all out of control, with guests having to fend off branches when walking around, his won’t fly. If you haven’t laid a finger on your garden since last summer, this kind of distressing dystopia may be all too real. The grass, hedges, plants and weeds will all have shot up quite rapidly over the last month or so, after the deluge of rain showers and the gloriously balmy days that followed. These are ideal growing conditions! However, they’re not ideal conditions for your sizzling-hot but very chilled-out BBQ. We recommend tackling the biggest jobs first, and cutting your lawn is the easiest and most rewarding place to start. It’s the first thing your guests will notice when they arrive, so before they walk the green carpet, mow it. It’ll make a huge difference. Depending on what the weather’s been doing in your part of the world, you may need to rake or even re-sod patches of your lawn where it has holes in, has gone yellow or the dog has messed it up. If your grass is quite long (let’s say over 10cm high), you’ll probably need to use a grass trimmer to cut it to a suitable height before using the lawnmower. Once it’s short enough, you can unleash the mower from the shed and finish cutting the lawn. If you want to go all-out and add preppy stripes to your garden, now’s your chance if you have a lawnmower with a rear roller. If your lawnmower doesn’t boast this refined feature, you could use an ordinary roller from your local garden centre instead. To get a much neater finish you should go around the edge of your garden with your trimmer in edging mode. Once your lawn is looking super-fine (it looks bigger now, doesn’t it? ), dispose of the clippings. If you’ve got a composter, you know what to do. Otherwise, add them to your garden waste bin. By the way, a composter is a brilliant BBQ conversation starter and it’s super eco-friendly, so we recommend popping down to the garden centre to grab a cheap one. Even after you’ve expertly manicured your lawn, if you have overgrown shrubs or hedges, it can make your whole garden feel shabby. If you naturally love to potter around maintaining your shrubs, bushes and flowering plants – trimming the overgrowth should only take a few minutes. However, if months go by between prunings, you might need a cold drink and a couple of hours. Safety and legal tip: before you shred your hedge with a trimmer, please check first that there aren’t any birds nesting. If there are, it’s actually illegal to disturb them, so you’re not allowed to cut your hedge. Another great BBQ conversation starter. If the coast is clear, take a look around the hedge and identify any thick branches that your trimmer may struggle to cut – you don’t want it to jam or break. Use a good sharp pair of secateurs to snip these off. Now, finally, get busy with your hedge trimmer. However, don’t get too snip-happy. If you cut it back too far and leave gaps in between the leaves, it looks patchy and Great Aunt Mo will mark you down on this one. At your BBQ there’s likely to be a million activities going on at once. Kids zipping around, grownups chatting, smoke billowing from the coals and drinks being served. So clear any walkways to minimise accidents. Not only do you not want anyone stumbling or having to step over stuff to get to the food and drinks area, but having clear paths simply looks smarter. Use a broom or a blower to clear the walkways of grass and leaves, then pay another visit to your composter with all that detritus. Equally, if you’ve got wooden decking anywhere, look for any spots that may need a touch-up of paint or a good scrub. If you have any inkling that your decking is ill prepared for clusters of friends and family walking all over it, check its stability. Look closely for wood rot or termites, and remove any stray nails. By adding flowers or a few new pot plants and hanging baskets, you can add a lot of colour and interest to your garden. Little touches go a long way. If there are areas of your garden that you don’t want guests to focus on, colourful flowers are your natural saviours – they’re an eye-catching focal point. You can also use them on the table where people will be eating or serving themselves food. In fact, a clever trick when deciding where to put your food or eating area is to position it so it’s surrounded by your garden’s best features. That way they’ll be in your guests’ eyeline for the duration. If you want a couple of floral statement pieces, you can buy them from a garden centre or flower shop ready-made – or alternatively you can DIY. Try an internet search for ‘upcycled flower planters’ and you’ll find they’ve become a bit of a thing. Following the recent royal wedding, the trend for ‘bowl food’, allowing people to mingle and chat while they eat, could be sweeping its way to your town. Nevertheless, people like to rest their feet every so often and tables are handy for food and drink. So it’s a good idea to get out whatever garden furniture you have and give it a good wipe-down. Bring out deckchairs, stools, indoor chairs and tables borrowed from your next-door neighbour. If your BBQ is likely to trail off into the evening, you may want to consider some mood lighting. A few well-placed lights will turn your garden into something really special as the sun goes down. Solar lights are easy to use, with no need to install wiring. For maximum impact, arrange them so they line a path or illuminate a bit of your garden you want to show off. Just remember they’ll need sunlight during the day in order to charge. Lastly, a fire pit is a great, sociable way to wind down an outdoor party. Just make sure it’s stocked with wood and surrounded by chairs beforehand, so all you have to do is sit back and relax in its cosy glow. Now that your garden’s BBQ ready, you can tackle your music playlist. Any ideas?